Alliance Lithuanian Days organizing committee. The photo was taken 100 years ago on November 1, 1916. 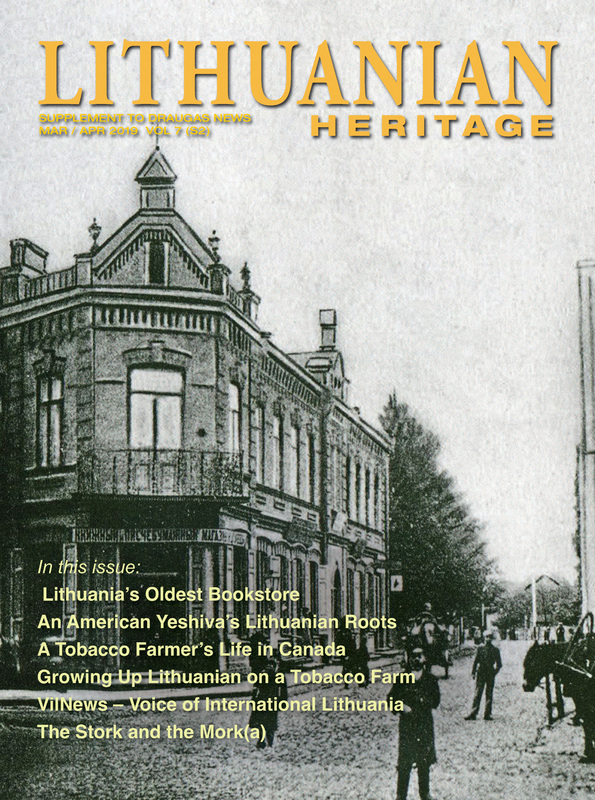 Founded in 1886, the Lithuanian Alliance of America, (LAA) the oldest continuously operating Lithuanian organization in the world, has a new lease on life as it expands its multifaceted activities promoting Lithuanian educational and heritage programs. Organized as a fraternal insurance organization, it had over 20,000 members and 300 lodges in its heyday. Today the Alliance continues to be an active member of the Lithuanian American Council promoting educational and charitable programs. In its day it helped finance the historic 1933 flight of Darius and Girenas. Its name was prominently displayed on the fuselage of the Lituanica as a testimonial to its largess. 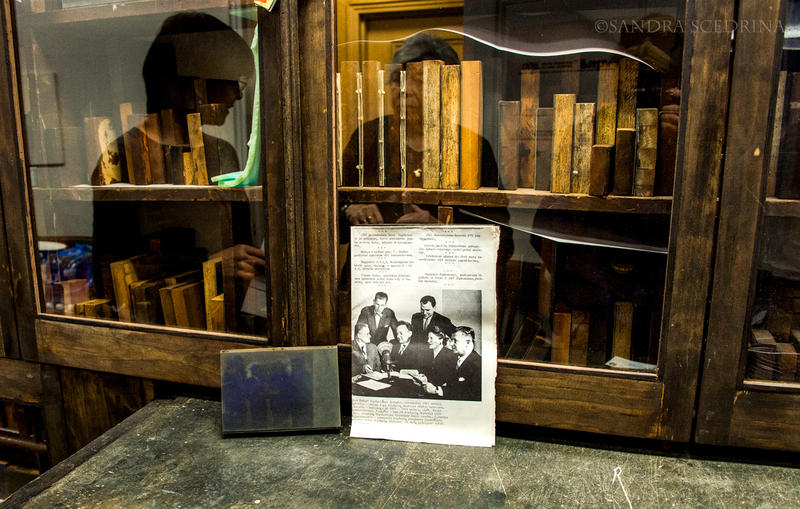 The Alliance underwrote extensive publishing and cultural programs and maintained a fully functioning printing press which printed its weekly newspaper Tėvyne/The Homeland and numerous books and other publications. The Fraternal insurance sector is presently undergoing rapid change. Many ethnic fraternals have ceased to exist through outright closures or mergers. Such a fate befell two other Lithuanian fraternals: the Lithuanian Catholic Alliance and the Lithuanian-American Workers Association. Both were originally part of the Lithuanian Alliance of America. Both were fully absorbed by other non-Lithuanian fraternals. Attempts made to reunite them were unsuccessful. From Lithuanian Alliance of America archives. The Alliance membership did not increase, and state agencies began to exert increased pressure by imposing new standards and administrative regulations. The Alliance struggled to meet these demands. The new regulations brought on greater financial and administrative burdens. There was concern that the Alliance would be forced to liquidate or be acquired by a non-Lithuanian fraternal. Alliance president Saulius Kuprys noted that the optimal solution would consist of the following elements: 1. Unload the unprofitable and resource-draining insurance operation, 2. Assure the financial security of its insurance members, 3. Continue to keep the Alliance as a membership organization, 4. Retain ownership of its name and historic corporate continuity, 5. Retain ownership of its Home Office building in Manhattan, New York, free of any mortgage or lien, and 6. Retain ownership of its archives and other non-insurance assets. The Alliance through great dint of effort successfully “unloaded” the major drag on its operations: the draining insurance service. Freed from the burdens of insurance bureaucracy, the Alliance was able to focus on its mission and apply its resources fostering its historic mandate to serve the needs of all Lithuanian-Americans and its affiliated Lithuanian-American organizations. As part of its reorgnization the Internal Revenue Service has confirmed the Alliance’s exempt status as a public charity under the vaunted 501(c)(3) Code section. Its standing as a central national orgnization was likewise confirmed through its group ruling determination. The principal asset of the organization is the building in Manhattan, New York. Its location alone bespeaks its importance, which is reflected in its 10001 zip code. The building is located one half block from Madison Square Garden and New York’s historic Penn Station, as well as the Central Post Office. The building is a four-storied strcture with a basement and patio garden. It is currently being used for various Lithuanian New York-centered activities. It is also home to the Lithuanian National Foundation. The first floor has been converted into a gallery. In addition to the art exhibits it is used for concerts, commemorations, and community meetings. 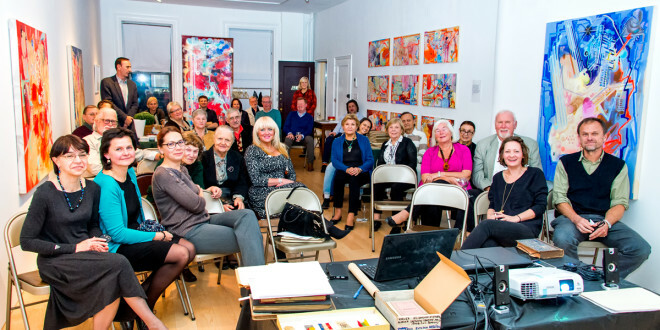 The Lithuanian Alliance of America has become the primary Lithuanian American cultural facility in New York City. It has developed into a multifaceted community organization bringing together a broad spectrum of artists and culture activits in the promotion and development of our unique culture and linguistic patrimony. The Alliance houses an extensive and unique collection that dates back to the 1890’s. 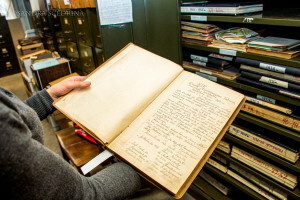 This archive encompasses a library of rare books, a periodicals collection, irreplaceable historic photographs documenting the community’s immigration history, and the organization’s data bank. 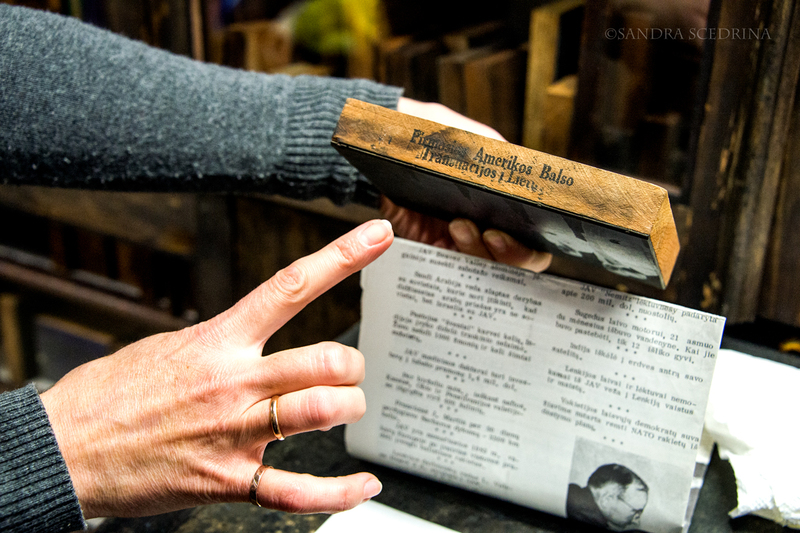 Some of the periodicals have already been microfilmed but a significant number still need to be processed. 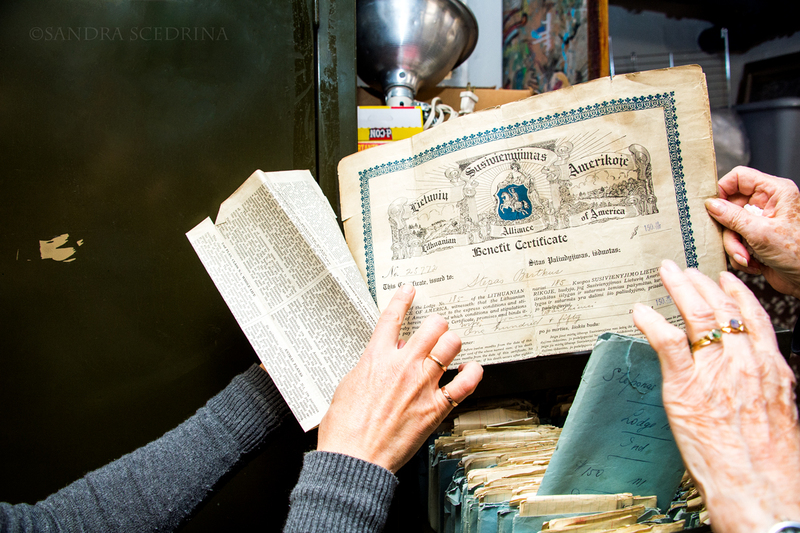 The organization is seeking funding to enable the preservation of its collection of unique historic publications. 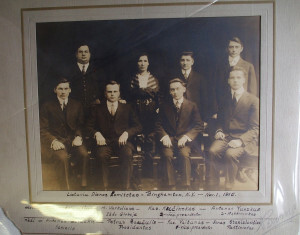 Grants have been received from the Lithuanian Foundation in Lemont, Ill. and the New York-based Lithuanian National Foundation. A number of scholars have visited the facility and are lending their expertise in accomplishing this. Among them are Prof. Ramūnas Kondratas, long time curator at the Smithsonian Institute; Dr. Joseph Skirius, Pedagogical University in Vilnius, an authority on immigration history; Prof. Giedrius Subačius Endowed Chair at the University of Illinois; Dr. Robertas Vitas, Director of the Lithuanian Research and Study Center in Chicago. 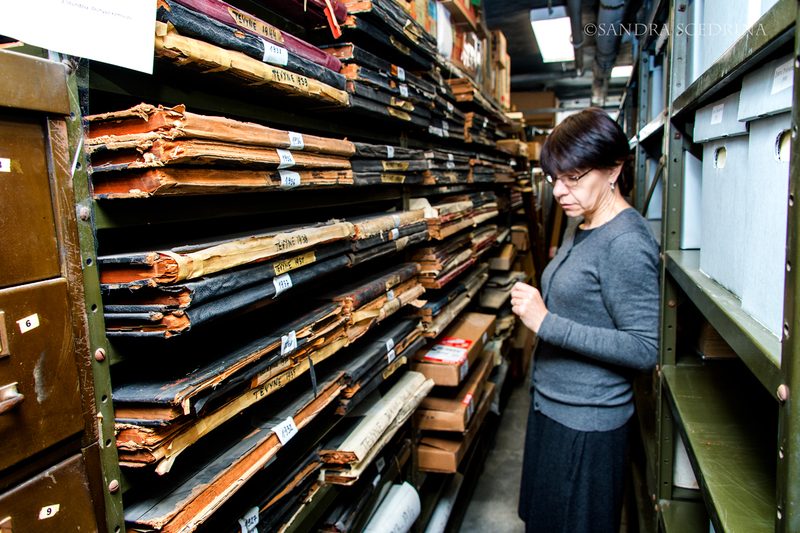 Most recently three scholars from Lithuania worked on the archives to organize, catalog and preserve this unique collection. 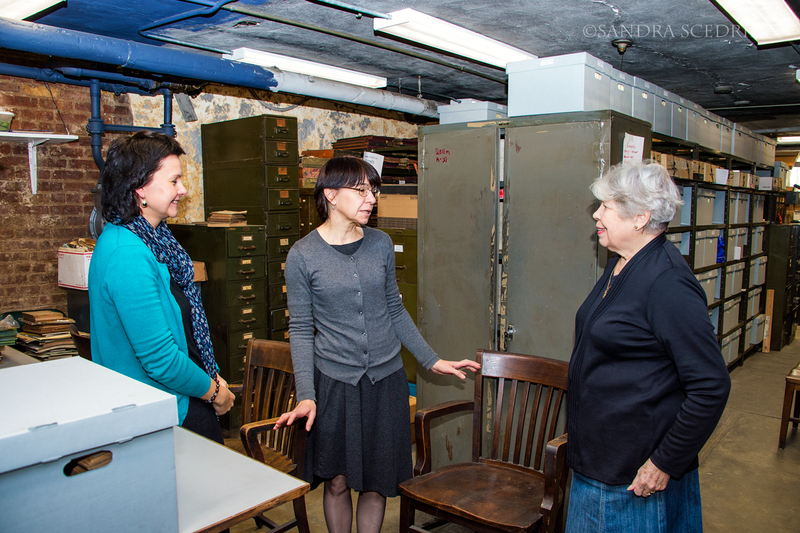 Three archivists from Lithuania in the Lithuanian Alliance of America archives. The Alliance Building has been the venue for academic lectures and readings, documentary and art film presentations, and as well as classical, folk and contemporary music performances. Academic visits by scholars. The following have made formal and informal presentations: Prof. Antanas Andrijauskas, Head of the Department of Comparative Cultures, Vilnius University • Prof. Tomas Venclova, Yale University, international authority on Slavic and Baltic Literatures, poet and cultural historian • Dr. Ramojus Kraujelis, Director and Coordinator of the Central Archives of Lithuania • Prof. Egidijus Aleksandravičius, Professor of History, and Director of the Emigration Study Center, Vytautas Magnus University in Kaunas, Lithuania • Romualdas Budrys, Director of the Lithuanian Art Museum, Vilnius • Šarūnas Birutis, Minister of Culture, Lithuania • Virginija Paplauskienė, Director of the Department of Émigré Literature, Maironis Museum in Kaunas. Lithuanian folk music was presented by Gintaras Vilčiauskas on the folk recorder and Vilius Marma, a specialist on ethnic folk instruments. SLA307 is an artist run artspace established in 2014, located on the first floor of the Alliance building. It provides local and international contemporary artists a forum to exhibit and discuss their work. 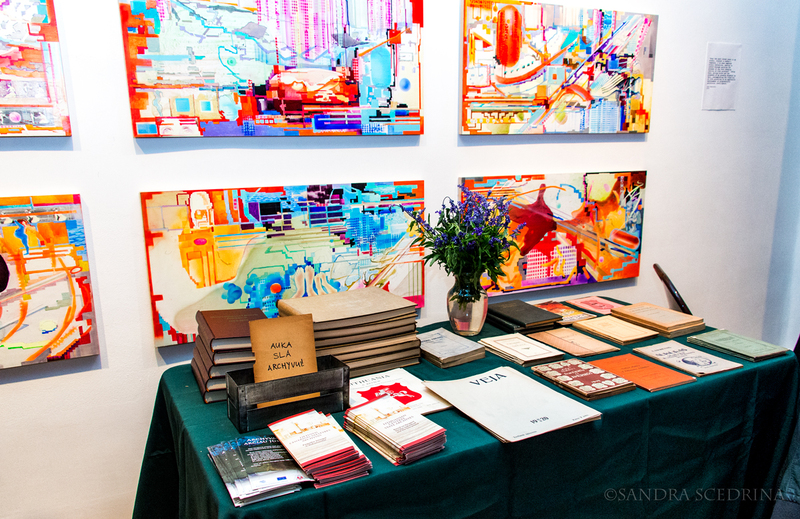 Most recently SLA307 organized solo shows of artists Ieva Mediodia and Daina Mattis. Previous exhibits included Lithuanian art and sculpture from the collection of Virginia and Peter Sirusas, an exhibition of American Folk Art from the collection of Laima and John Hood, as well as and exhibition of contemporary Lithuanian and Latin American art presented by Paul Debesys. The space is also used for film screenings. The films of Gabrielė Urbonaitė, Marija Stonys, Ramunė Sakalauskaitė, filmmaker and artist Moko Fukuyama, and veteran and pioneer of New York’s cinema culture, Jonas Mekas were screened. Part of the solo exhibition by artist Ieva Mediodia at the Alliance’s artspace, SLA307. When the Lithuanian Our Lady of Vilnius Church was closed some years ago, the community did not have a house of worship. The Alliance facilities are made available to the community for prayer services. While the Alliance does not promote any specific religious doctrine, it respects the needs of its community by enabling these. The facilities are available on an ecumenical basis. The Alliance promotes and supports Lithuanian folk culture. It has enabled the formation of a Lithuanian choral group, which met regularly at the Alliance center. This group participated in the North American Lithuanian Song Festival in Chicago and the North American Lithuanian Folk Dance festival in Baltimore. Folk traditions and crafts are among the other activities which the Alliance promotes. Among these are classes in traditional egg decorating during the Easter season and the making of traditional Lithuanian Christmas tree ornaments at Christmastime. The Alliance’s activities are bilingual, allowing participation by native Lithuanian speakers as well as those who value their heritage but are not proficient in Lithuanian. 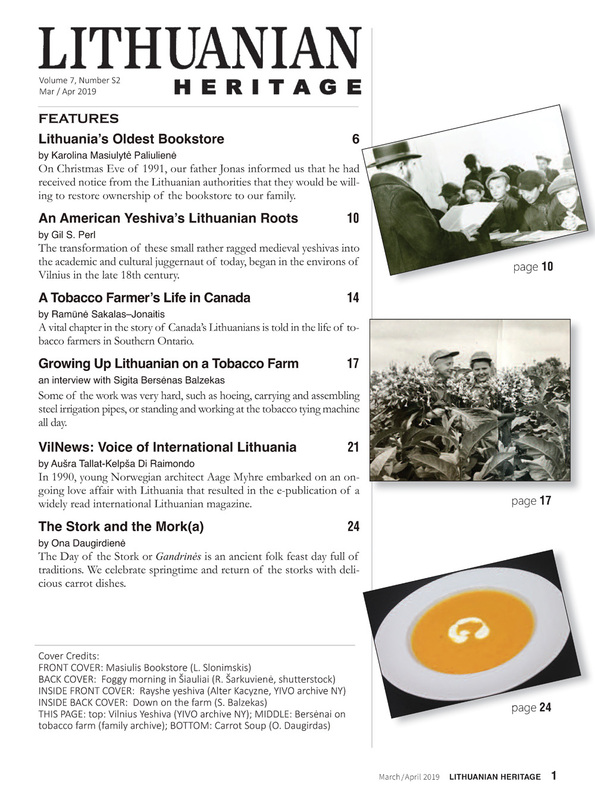 The promotion of Lithuanian language studies is actively pursued by the Alliance. The Alliance works with the New York Lithuania language school and cooperates with its parents committee and the faculty. Among the educational activities was a conference of Lithuanian language teachers which took place at the Alliance facility. Some 35 educators participated. In April of this year Lithuanian Language Proficiency Level Test for Juniors was held at the Alliance offices. 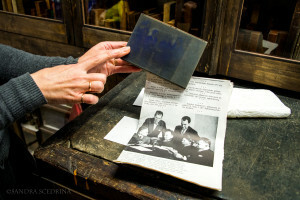 The test, prepared by the University of Vilnius, was initiated by the Kazickas Family Foundation and a group of Lithuanian Heritage Schools in the US, with support from the Ministry of Education and Science of Lithuania. The Alliance is especially proud of its participation in enabling this unique program. Individual membership dues are $25, family membership $35, and organizational membership is $100.